Pro tip: make sure the defining characteristics of your beverage match those of the hotdish. Or, for the adventurous amongst us, balance the flavors of your hotdish with a beverage that has the opposite flavor. That’s good advice, but there’s one other tidbit you’ll find especially helpful when pairing hotdish recipes with beer or wine: don’t gloss over the sauce. The creaminess, thickness, and flavors of a sauce will be one of the most distinct ingredients to join in a good pairing. Creamy, chunky, comforting — it’s the quintessential hotdish sure to satisfy the widest cross-section of Northerners. This tater tot hotdish is built with the basics of farm life, featuring ground beef, corn, and green beans. We recommend mixing the beef and garden veggies all together in the mushroom soup before going heavy on the tater tots. Beer to pair with tater tot hotdish: Smooth amber ales will happily hang out with the savory earthiness of cream of mushroom and common garden vegetables. Wine to pair with tater tot hotdish: Pinot Noir is an easy fit to complement the dark, earthy flavors. Stay cozy and satisfied while winter slowly drudges on. Beef stroganoff will be your trusted dinner companion. (Bonus: it’s an easy microwavable lunch if you’re trying to eat out less and get more work done at the office.) An alternative to beef for this hotdish recipe: choose another stew meat for your hungry diners. Beer to pair with beef stroganoff: Bright, citrusy pale ales can provide a refreshing relief from the thick, creamy base of the dish. Wine to pair with beef stroganoff: Cabernet Franc will offer a little red pepper spice and plum fruitiness against the buttery, heavy noodles and sauce. We all need recipes that cater to our preferences and nutrition needs. 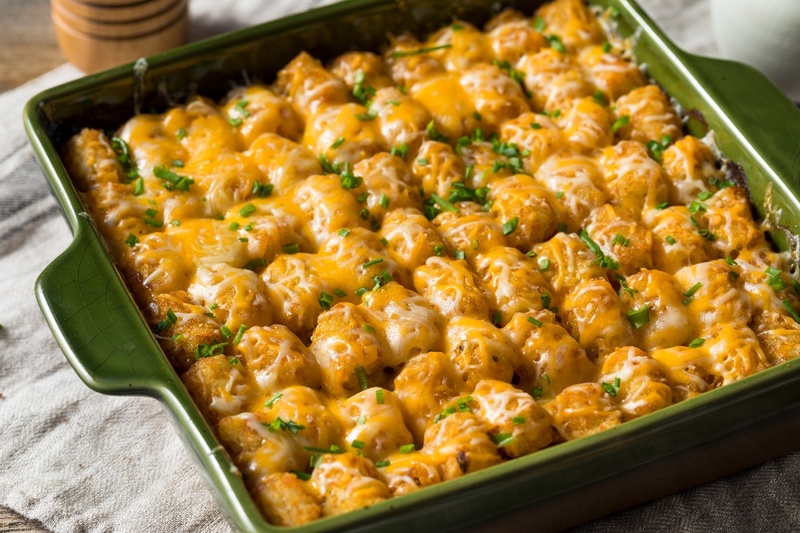 This hotdish can easily customize to your desires: Can’t get enough bacon? Upping your green vegetable game? Experimenting with different cheeses? This creamy chicken, broccoli, and bacon hotdish recipe can’t wait to be your new go-to. Beer to pair with creamy chicken, broccoli, and bacon hotdish: Caramel and chocolate notes in a brown ale may seem like a side step, but give it a try for an especially rich meal. Wine to pair with creamy chicken, broccoli, and bacon hotdish: Oaky Chardonnay is popular because people love to drink it, much like this hotdish will appeal to a variety of people around your table. Prefer something a little different? Go Beaujolais, which is a thin body, acidic bright red wine to play friendly with your hotdish. It’s time for a change-up. Just because you may be in the middle of the country doesn’t mean you can’t enjoy coastal flavors. A seafood casserole incorporates lobster, crab, and shrimp, which you can serve alongside toasty garlic bread and a leafy salad. Beer to pair with seafood casserole: Lager is a light, crisp, clean beer to serve with a creamy seafood dish. Also, try pilsner for similar territory. Wine to pair with seafood casserole: A Spanish white wine called Albarino is a dry, acidic, and tropical option. Choose Cava for citrusy, effervescent bubbles (which pairs with a large variety of foods, by the way). Who’s hungry? It’s time to hit the kitchen and stock up on beer and wine to make this the season of hotdish recipes that will keep you content for years to come.